Hard Cover, 320 pages, 8.75 x 11.25. What a fantastic showcase of antique saloon and beer advertising displays! 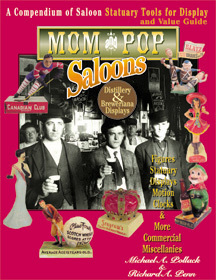 It's loaded front to back with full color -- a gorgeous mixture of old saloon interior photographs and breweriana from the authors' collection, all in a nice hard cover format. You won't be disappointed!